I will upload images to Ofoto over the weekend, but in the mean time, enjoy these images of Vancouver. 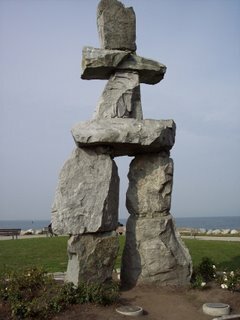 The stone sculpture, called Inukshuk, is a symbol in Inuit culture as a navigation marker. This symbol is all around Vancouver; miniature sculptures and pins are sold throughout the city as souvenirs. 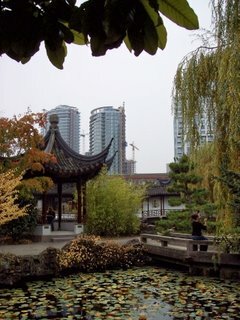 This is from within Dr. Sun-Yat Sen Garden, named after the founder of the first Chinese Republic and regular visitor to Vancouver. Calm serenity is found within the walls of the garden, yet, I find the building of the hectic 21st century around the garden ironic. Hmm! 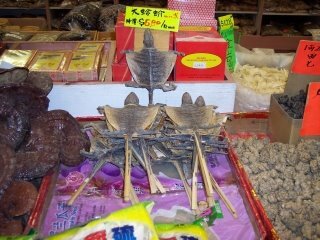 Dried lizard. It's what's for dinner in Chinatown. More great photos - as usual! !